Get tired to carry on the heavy purse with you? Always forget to take the important cards? Now you just need a ZVE WALLET CASE, you can get rid of all those thing. ZVE iPhone leather wallet case with a hidden cards and cash slot in the back. Magnetic Closure design can make your cards or case securest. Please noticed that every case is in good condition and each buttons can be sensitive to use. ✔100% fit for Apple iPhone 7 PLUS 5.5"
✔A Magnetic Closure to keep your cards or cash safe. No worry to lose your cards. ✔Durable base shell covers all sides includes raised lip edges to prevent the screen scratching the ground. Four corner bumpers provide shock-absorption. ✔Easily acceses:The covered raised buttons and cut-out for the speakers, ports, back camera and mute button are perfectly fit the iPhone. ✔Take this slim wallet case instead of taking a heavy and bulk purse with you. It has 3 card slots and 1 back pocket for cards and cash, very convenient for your daily need. 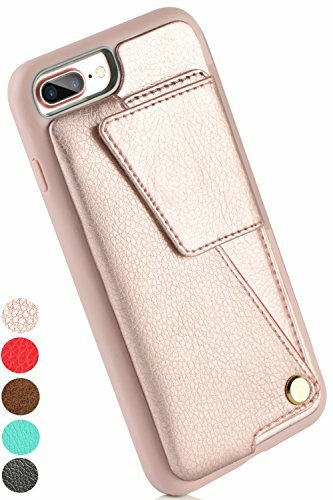 【COMPATIBLE】: ZVE iPhone 7 Plus / 8 Plus Wallet Case ONLY fits for Lager Apple iPhone 7 Plus / 8 Plus, the 5.5 inches version ! 【ROTATIONAL CARD HOLDER】: 3 Card Slots and 1 Money Pocket, carry around your essentials cards easily. 180°Rotation Card Slot, the card holder can be HIDDEN in the back. 【FULL-FRAME PROTECTION】: Covers all corners and includes 1mm RAISED EDGES and a TPU lip to keep the screen from scratching or touching the ground. Secure Magnetic Closure，magnetic flap to keep it closed and protected. 【HIGH QUALITY MATERIALS】: Made from PU Leather + TPU base shell. Our 100% handmade craftsmanship and amazing wallet design makes it even more fashion, durable and shockproof. Premium gift for Valentine's Day, Birthday, Christmas, Thanksgiving Day, Black Friday, Cyber Monday and New Year. 【SERVICE & WARRANTY】 100% SATISFACTION GUARANTEE-180 DAYS WARRANTY by "ZVE" only. Please feel free to contact us if any problems, our customer service team is always standby.